I believe we have accomplished our goal. We used the stylesheet from the new LearnKey website design, but changed the colors so as to set the LKVS site apart from the regular LearnKey website. We also moved away from the camouflage design we were using in the old design, deciding instead on a red, white, and blue color scheme to suggest the American flag. 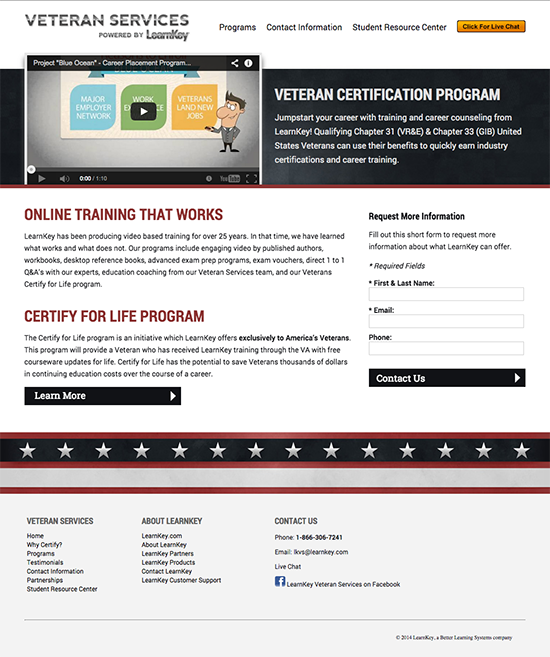 Two new features of the redesigned LearnKey Veteran Services site are the new Student Resource Center page and the Live Chat option. The live chat option allows students the option of chatting with a VR&E counselor to get answers to time-sensitive questions, while the Student Resource Center provides information on resources available to LKVS students and advisors. This page will be updated from time to time as more resources become available.